Address Downtown, the flagship hotel under Emaar Hospitality Group’s premium lifestyle Address Hotels + Resorts brand, has reopened its doors to hotel guests. The property has been closed since December 2015 after a serious fire swept the upper floors. The revamped Address Downtown has reopened with several innovative features including new restaurant concepts, additional rooms and suites, The Spa at Address Downtown, and a brand-new interior design. With 220 guest rooms and suites, several of them opening to spectacular views of the iconic Burj Khalifa and The Dubai Fountain, Address Downtown will add additional features in the coming days. Olivier Harnisch, chief executive of Emaar Hospitality Group, said: “Address Downtown holds a very special place in the hearts of all discerning travellers and guests. “Defined by its central location overlooking Burj Khalifa, the hotel has consistently secured the world’s leading tourism and hospitality awards. “With the opening of Address Downtown, Emaar is bringing to life a crowning glory in its hotel assets. 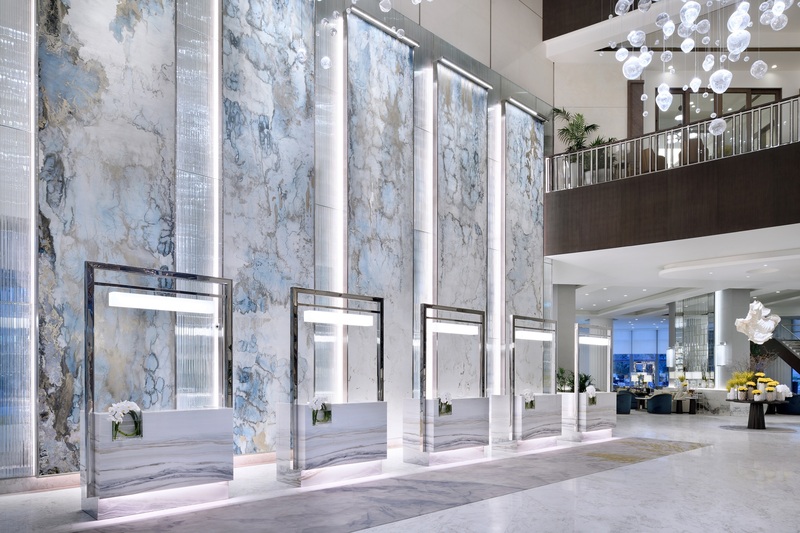 “Working with world-leading designers and consultants, the all-new Address Downtown ushers in an exceptional lifestyle choice and set new standards in luxury hospitality. Towering high at 302 metres in 63 levels, Address Downtown is one of the world’s foremost references for luxury hospitality, only 15 minutes from the Dubai International Airport. Set in the heart of Downtown Dubai, the hotel is in walking distance of The Dubai Mall and directly overlooks Burj Khalifa. Guests have uninterrupted views of The Dubai Fountain, the world’s tallest water-music spectacle. The hotel is also near the city’s business hubs such as the Dubai International Financial Centre and the Dubai International Convention Centre. Emaar, developer of the Address Downtown, is considered the Middle East’s Leading Hospitality Development Company by voters at the World Travel Awards.